Looking for a fast paced sport that’s easy to pick up and will give you an excellent cardio workout? Squash could be just what you are looking for. Squash is a fast paced, high energy game. It’s cheap to play, is sociable and once you get the hang of a few basic rules, easy to understand. 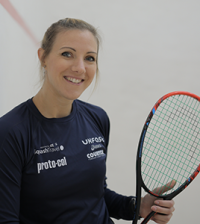 England is also a great squash nation, with five women currently in the top 20 world rankings, so there is plenty of inspiration out there for you too. This is a sport you need to play against someone of a similar standard, making it ideal for starting out with a friend or work colleague. It offers you a great cardio workout – in fact playing squash for one hour will burn between 700 and 1000 calories, which is significantly higher than many sports. Tennis for example would only burn about 400-500. It works both your upper and lower body and is great for toning your arms and torso. Squash courts are found both in and outdoors and are surrounded by four walls. The walls and floor are divided up by a series of lines. There is also a half meter-high metal area at the bottom of the front wall. If the ball strikes here it is out. The out line runs along the top of the front wall and the side walls. Shots hit above the out line, on any wall, are out. The service line along the front wall indicates the height the serve must be above. The first server chooses to serve from either service box. One of the server’s feet must be in the box, and when served the ball must hit the front wall above the service line and below the outline and land in the opposite quarter court. It can also hit the side walls but does not have too. The receiving player can chose to volley a serve after it has hit the front wall. If a server wins a point, the two players switch sides for the following point. First service is decided on the spin of a racket and the server serves until he loses a point. In squash you can only win a point when it is your serve. If you win a point on your opponents’ serve, service then passes to you. You must then win that next serve in order to gain a point. – your opponent fails to hit the front wall with the ball before the ball has bounced. Games are usually played to eleven points, unless the score is 10-10, in which case the non-serving player can chose whether to decide the game with the next one or next two points. Competition matches are usually played the best of five games. Unsurprisingly for a racquet sport that is played in such close quarters, obstruction must be considered. This is where lets and strokes come in. A let is given if a player would have been able to get to the play in the absence of interference from the opponent. The point is played again with the same server serving the ball. But if the player would not have got to the ball, or attempted the shot but missed it, then no let is called. Referees will call when a let should be played, if you are just playing socially it is up to both players to decide. A stroke can be awarded (again by referee or players agreement) if it is deemed the player did not make enough effort to get out of the way and thus prevented the striker from taking a winning shot. A stroke means the player gets a point or the service. If you hit your opponent with the ball (it does sometimes happen!) it is a let if the ball would have otherwise hit the side wall. If it would have hit the front wall it is a straight point. You can wear your usual sports gear. If you are playing inside, which is usual in the UK, it can get quite warm so shorts and a vest or short sleeve tee are recommended. You will also need a good sports bra suitable for high impact sports. Footwear with non marking soles are essential. To start you may want to just wear your regular trainers, and once you are playing regularly invest in a pair of squash specific shoes. When choosing a racquet head to a sports store where trained staff can give you knowledgeable advice. There are three main factors to consider when choosing a racquet, in addition to cost. Weight: Women tend to prefer a lightweight racquet, as do experienced players as they offer greater maneuverability. But because they deliver less force they require a powerful swing, so you may want to choose a slightly head-weighted model to assist you. Size and grip: It’s best to choose a mid-profile racquet that balances power and control. Stiffness: The more flexible a racquet is the easier it is to control, so this is better for novices. Prices can range enormously; from around £25 for the cheapest model to over £150 for a top of the range racquet. If you visit the official squash websites for England, Scotland and Wales you will be able to get information on local clubs. The English site has a comprehensive club finder on it, the other two are not so well constructed but it is a good starting point. 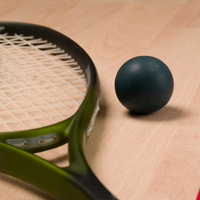 Many sports clubs and gyms have squash courts so it should not be difficult to find one. If you don’t have anyone to play with this is also a good way to find a partner or join a competitive squash ladder.